"I am not a bad man. I am not a hero. And I'm definitely not a president. And no, I'm not an officer. Do you know what I am? I am an idiot, with a box and a screwdriver. Just passing through, helping out, learning. I don't need an army. I never have, because I've got them. Always them.! 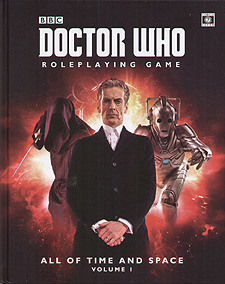 All of Time an Space Volume I contains four new adventures for the Doctor Who Roleplaying Game, taking the Doctor and his companions to strange new lands and into conflict with even stranger alien foes. From alien artefacts in the Tomb of Cleopatra to ghosts in the tunnels beneath Victorian London, from silver rats and strange plagues in Elizabethan England to a mysterious space station straddling parallel universes, adventure is never far away when you're the doctor and his companions!